Nothing is more beautiful than a healthy saltwater aquarium stocked with colorful fish and corals. Corals add a great deal of depth and intrigue to a saltwater aquarium but they can be difficult to keep. Unlike aquarium fish, you can’t just sprinkle some flakes into the tank to feed your corals – they require a delicate balance of light and other nutrients in order to thrive. If you are curious about keeping corals in your saltwater tank but you don’t know how to get started, you might do well with one of these low-light species. There are many different types of corals to choose from and they can be divided into categories. Soft Corals - Soft corals do not have hard, bony skeletons like stony corals and they are much easier to care for. 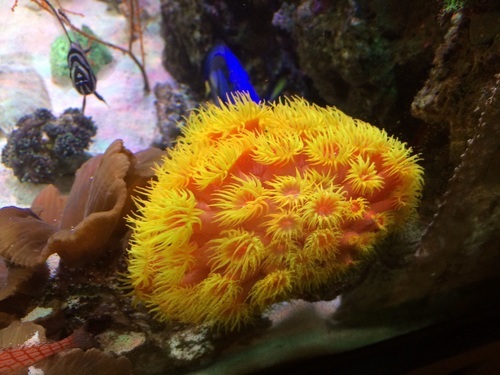 This type of coral tends to thrive in saltwater tanks that are rich in nutrients with low-level lighting. The major food source for soft corals is zooxanthella, though they will eat almost any kind of free-floating food in the water. 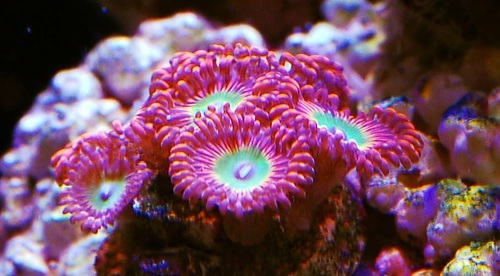 Zooanthids – Also known as button polyps, this type of coral comes in a wide range of colors and sizes. These corals are referred to as colonial corals because individual polyps grow and live together in groups. One thing to be wary of with these corals is that they produce a toxin called palytoxin which is very dangerous to humans – do not touch these corals with your bare hands! Star Polyps – This type of coral is native to the Indo-Pacific region and they are known for the reddish-purple color of their mats. 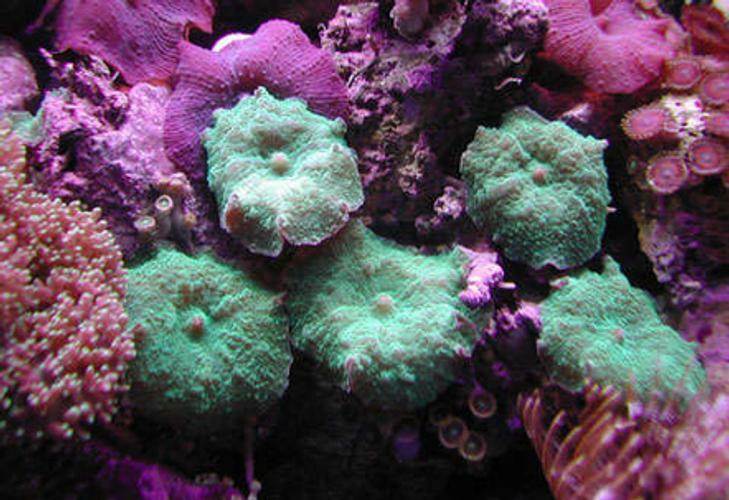 These corals are often bright green or brown in color with green or yellow centers to the polyps. Star polyps tend to prefer a moderate to high level of water flow and they can do well in either low or bright lighting. Pulse Corals – These corals get their name from the pulsating motion displayed by their polyps. Pulse corals come in a variety of colors and they feed on nanoplankton, phytoplankton, and bacterioplankton in the water. These corals have a feathery appearance with eight tentacles on each polyp. Now that you know the basics about some of the types of corals that are best for beginners you may be curious to know which particular species are recommended. Below you will find a list of low-light corals that are particularly recommended for beginners. Named for their bright green color, green star polyps are an excellent beginner species. This type of coral is incredibly hardy and low-maintenance – plus, it does well in low lighting and with varying levels of water movement. One thing to be aware of with green star polyps is that they grow and spread very quickly and they can take over other corals if you aren’t careful. This type of coral is very popular among beginners because it is very low-maintenance. Toadstool leather corals do well in low to moderate lighting and they grow very quickly. This species can get very large but they typically do not bother other tank inhabitants. These corals are also known as cabbage corals or finger leathers. This species of coral is very hardy and it only requires 3 watts of light per gallon to thrive. Kenya tree corals are named for their tree-like shape and they are popular for the gentle swaying motion they have in the aquarium. These may not be the most colorful corals but they are very easy to care for and they help to indicate poor water quality by closing up. These corals are named for the unique shape of their tentacles – they look like anchors or hammers. Hammer corals are available in a wide variety of colors including yellow, tan, brown, and green – they also come in two forms, either branching or wall formations. Wall corals grow outward to the side and branching corals grow upward. One thing to be wary of with this species is that they can sting other corals so they should be spaced widely enough apart that they have room to grow. Also known as the bullseye or trumpet coral, candy cane corals are a great low-light species of soft coral. These corals come in a wide range of colors including blue, green, brown and yellow. Candy cane corals have short tentacles that only come out at night and they are a very hardy species as long as the tank has adequate calcium levels. This type of coral only requires about 4 watts of light to thrive. These corals come in a wide range of colors and they also exhibit different textures which can add some intrigue to your reef tank. Mushroom corals are named for their mushroom-like shape but if the water movement in the tank is too high they will not fully expand to show this shape. These corals can grow with as little as 3 watts of light per gallon (or less) and they actually prefer to be placed in shady areas of the tank near the bottom. This type of coral is named for its sunny orange color and for their spherical shape. Sun corals can adapt to different levels of light and while they are very hardy they can be a little tricky to maintain because they must be fed when their tentacles are expanded – this typically happens at night. If you are willing to make frequent feedings, however, these corals are beautiful and a great option for beginners. These corals are named for their color and shape which resembles a cluster of frog eggs, or spawn. Frogspawn corals tend to extend their tentacles during the day which adds a level of movement to the reef tank and they have a beautiful green color. One thing to be wary of with this species is the fact that they are somewhat aggressive and may sting other corals that are placed close by. This type of coral resembles small underwater flowers and they are available in a wide variety of colors including bright yellow, pink, purple, green, and blue. Blasto corals do well in low light and they do not require a great deal of water movement. Another benefit of this species is that they are peaceful – they will not sting other corals and they are easy to maintain. These corals may be one of the easiest species to care for because they do well in varying levels of light (between 2 and 4 watts per gallon) and they are very low-maintenance. 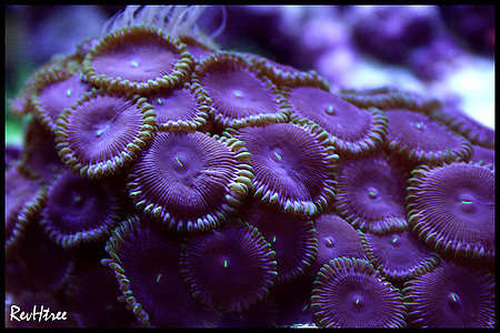 Button polyps do not require any supplemental feeding and they are peaceful enough to be kept with other coral species. These corals come in a wide variety of colors with brown and green versions being fairly inexpensive and more brightly colored options costing a little more. If you have always wanted to try cultivating a reef tank but have been nervous about getting started, don’t delay any longer! These low-light coral species are perfect for beginners because they are undemanding and very forgiving.